I apologise in advance for a long post… This is an intro to our A-Z Guide to a simple, sustainable and meaningful life. So far this blog has focused a lot on my life since being diagnosed with ME/CFS, Fibromyalgia and Pelvic Congestion Syndrome but I want to broaden it now because I am not my illness and I can’t let it dictate my life. Before the illnesses began to take over my life I was heavily involved with, and passionate about, living sustainably and looking after the environment. My new business, LiveKen, is focused on helping others to live simple, sustainable and meaningful lives with or without chronic illness. As such, I’d like to begin my broadening of this blog with a series of posts focused on helping you live a simple, sustainable and meaningful life. What do we mean by a simple, sustainable and meaningful life? The term ‘less is more’ is key to a simple lifestyle, taking the time to identify what is important to them and eliminate the rest. We need to do a stock take on our lives and our belongings and identify what it is that is most important to us and eliminate the things we don’t need, love or use regularly. I’ve begun this process myself and I’m slowly working my way through the house identifying the items I never or no longer use. I’m being tough on myself and not holding on to things just because they have sentimental value. Certain sentimental items are staying but most I’m passing on to new homes where they will be used and loved. I try hard not to schedule too many things into my day so that there is space in there for me to rest and reflect on how my life is going. This allows me to pick up on the negative things before they blow out of proportion so that I can try and solve them. Using this technique, which I’ve picked up from my friends, I’m beginning to feel happier about where my life is at. I can now see all the positive things I do have. By removing all the clutter and noise and being more mindful about your actions and possessions you too can begin to identify the happiness you already have in your life. Once you do that you can begin to focus on the activities and items that increase that happiness for you. A sustainable lifestyle is one that can be maintained and continued through all the ups and downs of life. It is not a fad or a one off thing, it is constant and ongoing. A sustainable lifestyle is one that takes into account the effect each action or purchase done as part of that lifestyle has on others and the environment. I’m not saying that everyone has to be a ‘greenie’ or a ‘hippie’ or whatever other term you’d like to use. These terms have very negative connotations but the reality is this planet is the only one we have and so we all need to do our bit (no matter how small to look after it). I’m also not saying that you can’t spend money on things you like. A sustainable lifestyle is one where you are financially secure and have all your basic needs taken care of (food, shelter, love, etc). It is one where you still get to have fun and purchase new and exciting items, but you do so within your means. You avoid bad debt (such as credit cards) and negative relationships so that you aren’t tied down by these. You also consider whether your actions are having a positive or negative impact on your own life, the life of those around you, and the environment that you live in. How can you incorporate Sustainability into your lifestyle? I know that most people have extremely busy lifestyles, and not everyone will want to go all out and do everything in a way that is completely sustainable, so the following tips are some simple and easy ways to incorporate a sustainable mindset into your day to day life. Buy Less. When you first think you want something new, consider whether it is a ‘need’ or a ‘want’. If it’s a ‘need’ get it, but if it’s a ‘want’ write it down somewhere and wait at least a week (preferably a month) and see if you still want it. If you still want it then, get it. Buy Local. I know there is a lot of hype about organic products being the best thing for you but I believe this can be cost restrictive for some. Instead, consider whenever possible if there is a local option available. Buy fruit and veg from your local farmers market, and if you need new furniture try and find a local designer/maker. Be mindful of your budget. Aim to keep spending under what you earn and save money for large purchases or emergencies in the future. If you use credit cards (like we do), pay them off in full monthly. Whenever possible don’t go into debt and don’t pay interest (mortgages are OK though). Recycle. 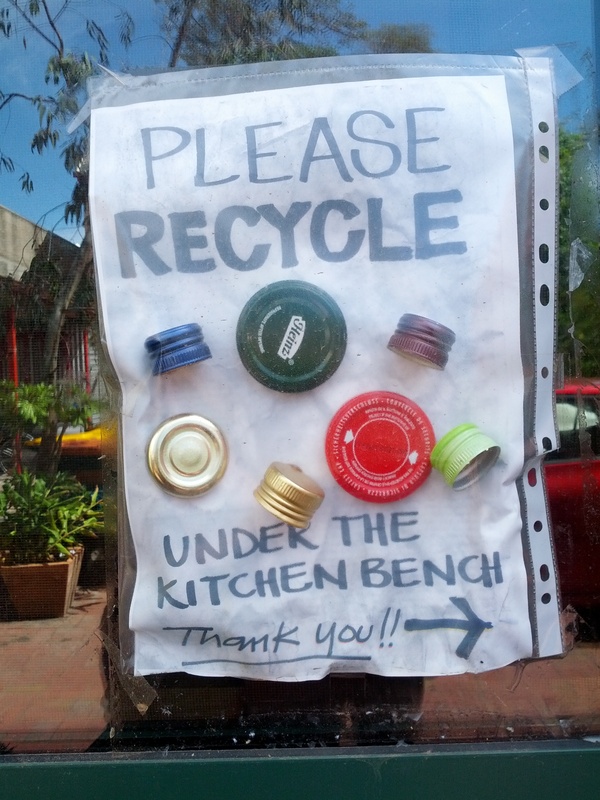 Most local Councils offer some sort of kerbside recycling program. Make sure you know how it works and utilise it properly. By doing this you reduce the amount of waste actually going to landfill. Some items shouldn’t go to landfill at all but can’t be recycled through the kerbside program (such as batteries and light globes), again check with your local Council for the most appropriate way to dispose of these items in your area. Make it. When you have birthdays, housewarmings and other celebrations try making gifts and cards yourself. If this isn’t possible due to time constraints, buy people experiences instead of stuff. To live a happy and fulfilled life it is important to participate in activities that are meaningful for you by identifying what is most important to you. By doing this, and simplifying your lives so that everything you do aligns with at least one of the things that are important to you, you know that each and every thing you do is meaningful and has a purpose. Since identifying these areas I now assess my actions and activities to check that I’m doing something towards each of these every day. By doing this I know that what I’m doing is meaningful. It is helping me fulfil a need or helping me help others through meaningful and purposeful work. LiveKen has been set up as a result of me searching for a way to do meaningful and purposeful work while dealing with debilitating chronic illnesses that have interfered with my ability to live the life I had before. Since attempting to live my life by these three principles (simple, sustainable and meaningful) I have begun to feel happy and fulfilled despite my conditions. They help me maintain a positive outlook on life even through the tough times. Yes, I still have my ups and downs but overall I’m feeling good about life. By living by these principles, you too can begin to feel happy and content with your life instead of stressed out and negative. Give it a try! This A-Z guide to living a simple, sustainable and meaningful life has been developed with chronic illness in mind. That is to say, the topics that are covered have been developed from the point of view of someone living with chronic illness but they are relevant to anyone and everyone. Stay Tuned! Throughout November I’ll be expanding on each of these in their own post. Have you taken steps towards a simple, sustainable and meaningful life? Let me know if there is anything you’d like me to address in the expansion posts!